Tommie Hoban trains with the Dons yesterday and looks set for a European debut tonight. Aberdeen manager Derek McInnes believes defender Tommie Hoban can be a pivotal player for the Dons this season. The 24-year-old could make his debut for the Dons in tonight’s Europa League tie against Burnley at Pittodrie after joining the club on a season-long loan deal from Watford. The former Republic of Ireland under-21 international has recently returned after missing the whole of last season with an anterior cruciate ligament injury. Goalkeeper Tomas Cerny also joined the Dons yesterday. The 33-year-old was a free agent after leaving Partick Thistle at the end of last season following their relegation to the Championship. McInnes said: “Tommie Hoban is a player we have been keen on for the last few weeks. He played in Watford’s pre-season games and is someone his club has a high regard for. “He’s had a lot of injuries in his career but he’s been given this opportunity to come here and play games and, if he stays free from injury, I think he will be a fantastic addition for us. I’ve got to know Tommie over the last 10 days or so and I really like him as a boy. McInnes also believes Cerny can be a capable understudy to first-choice stopper Joe Lewis following Danny Rogers’ loan move to St Mirren. He said: “When we allowed Danny Rogers go out on loan to St Mirren we knew we were taking a little bit of a risk and we were scouring for someone who can give us that bit of comfort and cover for Joe Lewis which isn’t always easy. 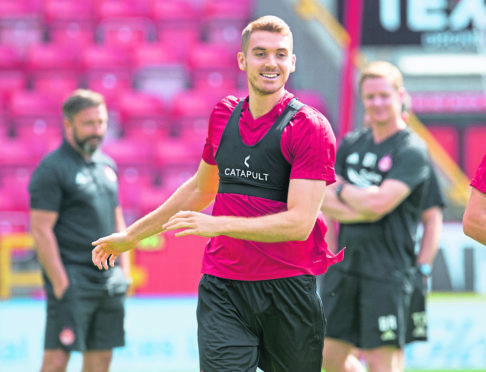 Former Hearts defender Krystian Nowak, who has been training with the Dons, will get a chance to prove he is worth a deal in Sunday’s friendly against Arbroath. Burnley’s preparations for the match took a turn for the worse yesterday after their flight to Aberdeen was delayed for several hours by a technical fault.